As we prepare for the upcoming 2017 Geneva Music Festival, we are excited to note last season was one of the most successful in our organization’s history! Hobart and William Smith Colleges welcomed us into a new concert home in Geneva, an acoustically-pristine space in Froelich Hall of the Gearan Center for Performing Arts. Our sixth year of presenting engaging music to audiences throughout the Finger Lakes comprised a robust schedule of 15 concerts and two dance events over the course of 17 days. A host of world-renowned guest artists presented a diverse range of performances, including our first vocal concert. Also for the first time, we dedicated a week-long celebration to Latin music and dance. More than 1,000 people attended GMF concerts and events in Geneva, Canandaigua, Auburn, and Skaneateles. More information about the events that took place as part of the 2016 season can be found in our annual report. The 2017 series will take place from June 1 through 17, and we will again present new artists alongside returning favorites. GMF veteran and acclaimed violist Eric Wong will introduce audiences to the Cavani String Quartet, which he joined earlier this year. The Quartet-in-Residence at the Cleveland Institute of Music, it has been described by the Washington Post as “completely engrossing, powerful and elegant.” Their impressive 30-year career has garnered many significant awards and honors and they have commissioned, premiered and performed the music of more than 30 living composers. 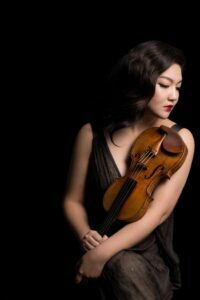 Critically acclaimed violinist Jinjoo Cho also joins the GMF for the first time in 2017. She is founder of a chamber music program for high school and college students in Cleveland, Ohio, as well as part-time faculty at Oberlin Conservatory. She writes “The Art of Practice” column for the performing arts magazine, “Auditorium” and travels throughout Korea to perform free concerts as part of Classical Revolution Korea. Among the returning favorites to GMF is cellist Clive Greensmith of the Tokyo String Quartet and faculty at the Manhattan School of Music. A graduate of the Royal Northern College of Music and the Musikhochschule in Cologne, Greensmith has appeared with the London Symphony Orchestra, the Royal Philharmonic, English Chamber Orchestra, Mostly Mozart Orchestra, Seoul Philharmonic, and the RAI Orchestra of Rome. He has won several prizes including second place in the inaugural “Premio Stradivari” held in Cremona, Italy. The GMF also welcomes the return of violinist Ani Kavafian, a soloist, recitalist, and chamber musician who has performed with the Chamber Music Society of Lincoln Center since 1979. She also has performed with virtually all of America’s leading orchestras, including the New York Philharmonic, Philadelphia Symphony Orchestra, Cleveland Symphony Orchestra, Los Angeles Chamber Orchestra, Detroit Symphony Orchestra, and San Francisco Symphony Orchestra, among others. Kavafian is currently on faculty of Yale School of Music. We can only offer this brief peek at our 2017 season today, but watch our website and newsletter for more details! If you haven’t already, sign up online to receive our newsletter so you don’t miss any announcements, and be sure to follow us on Facebook and Twitter. Each time we celebrate a season and prepare for the next, we feel deep gratitude for those who make our events possible. We again thank the 2016 sponsors who provided the support that transformed GMF 2016 from an idea into a reality: Hobart and William Smith Colleges; Finger Lakes Community Arts Grants; the Arts and Cultural Council of Greater Rochester; the Rochester Community Foundation; The John Ben Snow, Emerson, Rickey, and Delavan Foundations; CNY Community Foundation; the Wyckoff and Williams Family Foundations and the Rotary Club of Geneva. If you would like to support GMF in its 2017 season through donations or volunteer efforts, please visit our contribute page.